ABC Was Awarded the "China's Most Promising Companies 2011"
Recently, in the award ceremony for the "China's Most Promising Companies 2011" and corporate awards held by The Asset magazine in Hong Kong, Agricultural Bank of China Limited (ABC) was awarded the first prize of "China's Most Promising Companies 2011" (banking/financial) with its outstanding performance, and became one of the 19 Asia-Pacific companies wining the top corporate award "Platinum Award". Mr. Liu Xiaochun, Head of Hongkong Branch of ABC attended the ceremony and accepted the award on behalf of ABC. The magazine The Asset is one of the most influential financial magazines in Asia, and grants professional awards each year, which enjoys high popularity and authority in the global financial market. 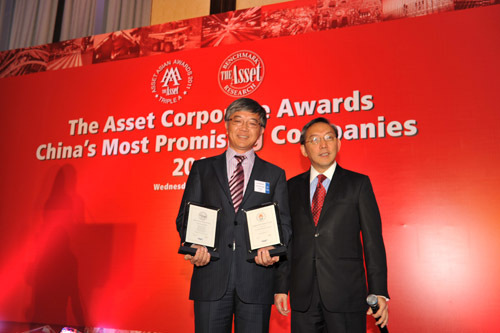 The Asset editing team selects China's most promising companies by means of qualitative and quantitative analysis methods and grants the "China's Most Promising Companies 2011" awards to the most promising companies in ten industries such as banking/financial, infrastructure construction, real estate, transportation and communication. The selection of corporate award winners is based on corporate financial performance, corporate governance, social responsibility, environmental responsibility and investor relationship to honor the most sustainable enterprises. Winning the award indicated that the international capital market recognized the noticeable progress ABC made since it came into market listing over one year ago in terms of corporate governance, risk management, business performance and social responsibility.